The financial crisis of 2008 devastated national economies around the world. We are still recovering. But the spotlight is only now beginning to be shone on one issue that could fracture national economies again—the youth unemployment crisis. Many 15 to 24 year olds are struggling to find jobs, to further their education, and to cope with a new world order in which they perceive they have no role. In the US, youth unemployment hovers at around 16 percent. But the average in Europe is 22.6 percent (Germany is the notable exception at 7.9 percent). Even in Hong Kong, which is often assumed to be one of the most dynamic economies in the world, the youth jobless rate stands at 11.6 percent. If we remove students from the equation in the EU, the overall unemployment number decreases to 8.7 percent. Still, those students face bleak employment conditions upon leaving education. European leaders are now taking the crisis seriously. But the new initiatives they are proposing won’t help unless they get at the roots of the problem: lacklustre economic growth, a rigid labour market, varying perceptions of work, and a mismatch between potential employees’ skills and employers’ needs. To get to the crux of the crisis, let’s look at each one more closely. The leap from school to the workplace is more fraught with fantasy than ever, and here’s why: schools continue to train students for jobs that no longer exist. In the EU alone there are major flaws in the education system that go unfixed because institutions refuse to work together. Imagine if educational policies were influenced by economic policies, and vice-versa? The world is constantly changing—but the education system continues to drag its heels. In recent months, European governments have stepped in to pledge EUR 8 billion to combat youth joblessness. One new programme, “Youth Guarantee,” will offer job training and apprenticeships. It does not, however, guarantee jobs. And this highlights a major disconnect: jobs are a consequence of economic growth. If there is no growth, there will be no new jobs. All the training in the world can’t create jobs. Employers are also reluctant to hire young people because they are constrained by inflexible labour markets that carry the legacy of antiquated social welfare systems. Labour market policies in the EU are out of whack with economic realities. They need to generate agility, mobility, and transferability. But right now the labour market is essentially “protecting” itself (the status quo) from those who can create conditions for a new era of stability (young workers). In some societies, certain jobs (especially vocational ones) are considered “low” status. People in rich countries tend to thumb their noses at these jobs, even if they require a high level of skill. None of this is lost on young people. In a recent study[i], nearly two-thirds of the young people who participated agreed that vocational training is less valued by society. Unsurprisingly, fewer than 40 percent of those who said they preferred vocational work actually sought out this type of training. And yet, 70 percent said they viewed a vocational path as more helpful in securing employment; half said they found it more appealing than pursuing higher education. This data gave us a powerful insight: perceptions of what work means can matter more than economic survival. There are a large number of young, educated people available for work, but many companies still can’t fill their vacancies. A recent survey conducted in nine EU countries provides some illumination[ii]: 43 percent of employers said that candidates don’t possess the skills they need. Yet 72 percent of educators believe new graduates are qualified to land jobs in the real world. Where’s the disconnect here? Educators don’t always know what employers are looking for, yet they think they do. Graduates may have skills, but not the right ones. The youth unemployment crisis shows no signs of abating. It’s even more staggering if we look at the ramifications by country. In the UK, for example, youth unemployment cost the country GBP 4.8 billion in 2012—more than the entire budget for educating 16 to-19-year-olds. This is in addition to the estimated GBP 10.7 billion in lost output for the same year. [iii] It shows that unemployment is more costly than more people think. It’s like dismantling the pieces of a slowly sinking ship in order to make a fire to signal for help. It can only go on for so long. Unemployment figures are expected to increase this year. Countries will continue to suffer significant losses if little or no action is taken to address the root issues of unemployment. We can’t stress this enough: it is paramount for governments to make impressive and corrective efforts to keep the crisis from worsening. It’s not just our young people who lose out if they cannot find work—society as a whole will suffer tremendously. Our future is at stake. Dr Terence Tse is Associate Professor in Finance at the London campus of ESCP Europe Business School. He is also the Head of Competitiveness Studies of i7 Institute for Innovation and Competitiveness, an academic think-tank. He can be reached at terencetse.com and @terencecmtse on twitter. 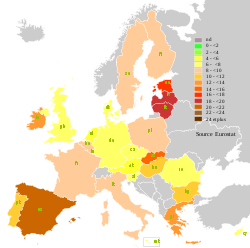 This entry was posted in Business, Europe and tagged education, growth, labour markets, unemployment, youth unemployment. Bookmark the permalink. One ‘corrective effort’ is to help these young people towards solo entrepreneurship, freelancing & contracting. Western economies won’t revert to the ‘old way’ – ‘new way’ needed.